Only with the best wireless router can you game, stream, and browse better. Here, you are looking at a top-performing Wi-Fi router to keep all your devices connected. Whether you are in a large home, a small apartment, or you need a router exclusively for gaming, you will need a router tailored to your needs. Unfortunately, the market does not only present us with a countless number of wireless routers, but you also need to sort through tech jargon to get to the router you need. We’ve sort out the brands to bring you this list of the best wireless routers. A wireless router rids you the mess of connectivity wires while meeting your internet connection needs. With every household having more and more gadgets, it is essential that you look for a router that can meet the demands of the modern home. We have chosen the Netgear Nighthawk R700 AC1900 as the best wireless router. It is a well-rounded router that performs with excellence when it comes to technology and data transfer rates. It is a dual-band router that operates at stunning speeds of up to 1900Mbps shared on two bands. On the 2.4Ghz band, it can give you up to 600Mpbs speeds while it can achieve up to 1300 Mbps on the 5GHz band. It has an excellent throughput that allows it to be used with gaming consoles as well as downloading and streaming of movies and videos. This is an 802.11ac router which means it supports advanced features. You can say goodbye to the buffering icon thanks to this router’s Dynamic Quality of Service (QoS) and Beamforming technology. With dynamic QoS, you can give network priority to your gaming consoles so that you can have a fluid experience instead of receiving choppy images. This feeature comes in handy when two or more people are doing different things such that it is not a network priority if you are doing a print job as it is to a family member streaming live videos. Beamforming technology allows this router to send the Wi-Fi signals directly to your media device instead of it broadcasting to all directions. It means faster speeds so you can complete your tasks in good time. 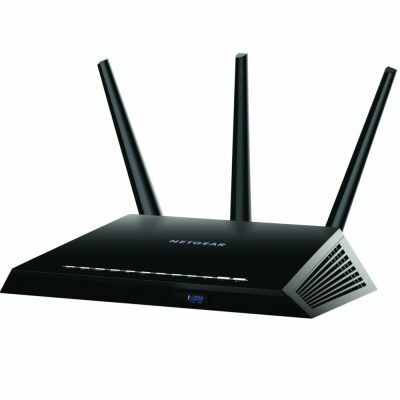 The Netgear Nighthawk R7000 comes with powerful antennas and amplifiers. They promise faster speeds and more extended range as the Wi-Fi signals can travel through walls to reach to your device in the uppermost room as well as your backyard. Better still, you get to control your devices using voice commands as it supports Amazon Alexa. It also has Disney Smart Parental Controls which helps to manage your family’s access on the internet. Setting this router up is fast and easy with the help of Netgear Nighthawk application. The application also gives you controls at your fingertips. From the parental controls to limiting the screen time and internet access, you can have it all with this router. If you are looking for a wireless router with many useful features, you will love working with the Netgear Nighthawk R7000. With a powerful dual-core processor and operation on a dual-band frequency, this is the most applicable router for home applications. 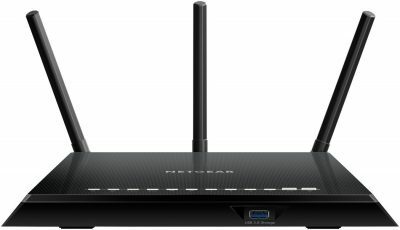 The Netgear Nighthawk X10 AD7200 is a one of a kind router. It is ideal for use with gaming consoles and the most demanding 4K streaming jobs. It supports the 802.11ad standard that is suitable for large homes and offices. It is a hub of intuitive features which have quickly propelled it to the top even at a high-end price. First, this router supports MU-MIMO. This means all users will be connecting to the internet simultaneously without any lag incidences. This router includes 60GHz circuitry as well as 160MHz Wi-Fi technology. It is no wonder why you will see it in offices, but also available for the consumer market. This router boasts a 1.7GHz quad-core processor. It allows connection to multiple devices while promising seamless input of commands. Being a triple-band router, it can reach speeds of up to 7200Mbps. The 2.4GHz delivers 800Mbps, 5GHz provides 1733Mbps, while the 60GHz delivers up to 4600Mbps data rates. You will need to have 802.11ad circuitry networking to take full advantage of the 60GHz band. It guarantees fluid streaming of 4K videos as well as transferring of large data files and VR gaming. You can automatically share and manage audio files, photos, and videos through Plex Media Server support and Amazon Drive Cloud backup. You get six gigabit Ethernet LAN ports, SFP+ Fiber (10GB) LAN ports, and two USB ports. It also has a WPS button, LED On/Off switches, a WAN port, and an ON/Off button for Wi-Fi. Data transfer improves significantly through Ethernet Port Aggregation. Managing this router is effortless using the Nighthawk app. It provides you with access to the dynamic QoS for bandwidth prioritization, guest network, parental controls, etc. For the best all-around experience in Wi-Fi and direct internet connectivity, the Netgear Nighthawk X10 got you covered. This triple-band router delivers the fastest speeds on the 802.11ad Wi-Fi standard. It is future-proofed meaning you will use it for a decent time. Linksys EA7500 AC1900 is the latest entry in the Linksys line of routers that support MU-MIMO. This is a system that eliminates sequential services and instead offers its services simultaneously to multiple users. It utilizes 802.11ac protocol which allows lots of management features for the ultimate internet experience. 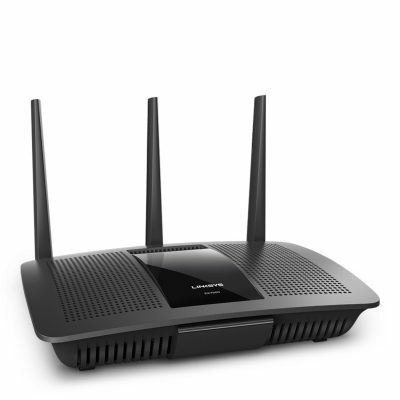 From the design, Linksys explores a black matte finish on a large router with three removable antennas. Even with its width, we don’t foresee it sticking out alongside your other devices. It features a high-speed throughput thanks to the dual-band frequency band that allows data transfer rates at up to 600Mbps on the 2.4Ghz and 1300Mbps on the 5Ghz band. Surprisingly, this router does not suffer any delays on the 2.4GHz band. This aspect allows it to be great in homes where you have numerous devices that share the 2.4Ghz band. Its 1.4Ghz dual-core processor is perhaps the fastest in its class. It provides you with smooth streaming as every command is executed fast. This router allows you to connect up to 12 devices. All your family members can access the internet at the same time and experience the same speeds. When operating in the 5Ghz band, you will be able to operate gaming consoles as well as operate 4K TVs as well as tablets and smartphones all at the same time. With the help of beamforming technology, this router can focus the signals so that it can get to your specific device and no signal will be broadcast where it’s not needed. Linksys EA7500 AC1900 is a host to four gigabit Ethernet ports. They allow a wired connection to your devices. This improves data transfer rates to 10x more. This feature makes it great when you need speedy file transfers or fast wired gaming. It also comes with a USB 3.0 that helps to transfer data and share files across the network. Linksys Smart Wi-Fi App helps to customize the tools of this router at your fingertips. The app provides you with QoS options, creating of a guest network, and parental controls. Setting up of this Linksys router is simple by connecting it to an internet modem and your PC to the Linksys secure network. Linksys EA7500 AC1900 is an incredible wireless router if you have a large home. It has an extended range of reach as well as support features for customized connection experience. It will keep all your devices cruising owing to the MU-MIMO and dual-band frequency. You don’t always need to cough a lot of money to get a good wireless router. TP-Link AC1750 Archer C7 provides with a practical solution for your home. 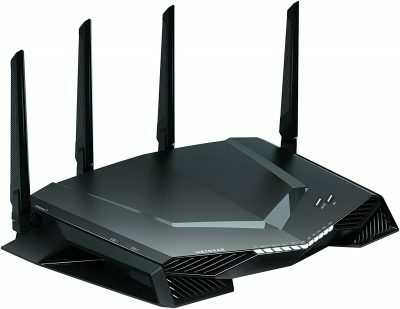 With 1750Mbps speeds, this router offers remarkable performance for gaming as well as streaming. This router supports the next standard of Wi-Fi technology 802.11ac. It provides simultaneous operation on the 2.4Ghz band at 450Mbps and 5Ghz at 1300Mbps. You will find it incredibly fast as it is three times faster than the n generation routers. It is a match for your gaming consoles giving you hours of smooth streaming at a fraction of the price of high-end wireless routers. The TP-Link Archer C7 AC1750 expands your coverage by using three external antennas. It has a total coverage of 2500sqft thanks to the high-antennas that give you reliable performance in a large home. It has three internal antennas that enhance connectivity. You can even position this router towards the room that needs the fastest Wi-Fi connection. This router supports Gigabit wired connections using four LAN Ports. It provides you with 10X fast connections with devices that need high-speed connections. You will like that it has USB 3.0 for large files transfer and USB 2.0 for small files transfer. It is a well-rounded router that is future-proofed since it is IPv6 supported. With TP-Link mobile app that is available for both iOS and Android phones, you can control and manage the settings of this router. It allows you to set up the guest network while protecting your files and data. You can quickly update the router and set the guest privileges from the app. Even though its cheap, TP-Link Archer C7 that you can get more from your router than what you bargained for. It is a dual band frequency router whose performance is top-notch and at par with upscale routers. 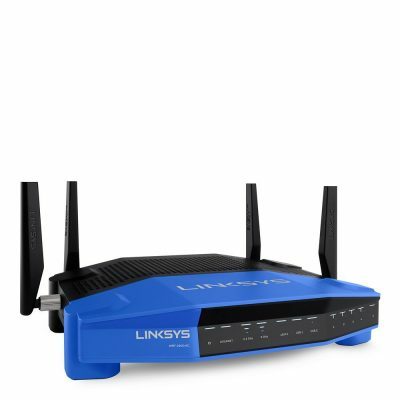 If you are looking for a beefy router, you got the Linksys WRT to match your needs. It is a future-focused router that has the potential to give you complete network control as you can flash the firmware using OpenWrt. With four antennas, this router is about to give you outstanding range and reliable performance. It is a safe bet for a large office and home. 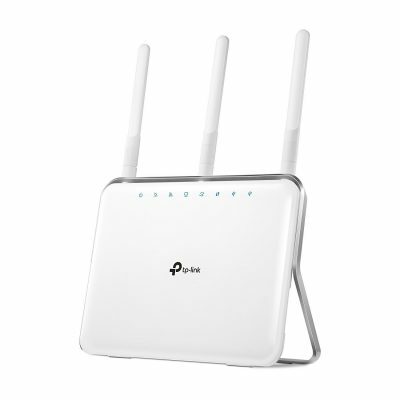 It operates on a dual-band; 2.4GHz and 5Ghz frequency for the strongest Wi-Fi signal. It allocates simple tasks to the 2.4Ghz frequency giving you 600Mbps speeds. For more tasking jobs like gaming and UHD 4K streaming, you have the convenience of the 5GHz band at 1300Mbps. This router is home to a 1.2Ghz dual-core processor, 128MB flash memory, and 256MB DDR3 RAM. It is by no means an entry-level wireless router as it guarantees speedy executions of commands. You will notice that it is a massive router, but aside for the components, Linksys includes a fan and airflow vents to keep the device cool. Its blue highlights on the black body give it a unique look. You can mount in the wall, ceiling, or sit it alongside your other devices. It may not match with most décor but who cares if it performs like a beast? It looks impressive more so because of the strong antennas that can hold up if you keep turning the device. It is one of those you won’t be afraid that the antennas are flimsy, and will break at the next turn. With a WAN port, four Gigabit Ethernet ports, and dual USB ports, this router is ready for connected data transfers. It has unique beamforming technology that uses three of its beams to focus the signal to specific devices. This gives you faster data transfer rates. This high-end router is worth every dollar. It focuses on fast connectivity for multiple devices. It delivers high throughput for the most demanding Wi-Fi needs. It sets up easy and has mobile control support through the Linksys Smart Wi-Fi App. 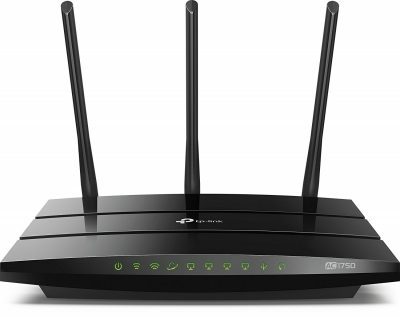 TP-Link Archer C9 AC1900 is a sleek wireless router that will look good in your home or apartment. Featuring a glossy white finish, it doesn’t matter your décor color preferences as this router will match with all designs. Designed to offer long-range Wi-Fi, this router has an impressive coverage of 3000Sqft. It caters for your Wi-Fi needs when you have a large household. It delivers fast internet operations for the most demanding needs especially gaming and 4K UHD streaming. Using beamforming technology, this router enables you to focus Wi-Fi signals where you need them. Its dual-core processor and dual-band frequency operation allow use with as many devices as you’d like without lags. It is the best buy for a reason since you are about to experience the perks of operation on two frequencies. If your household is replete with laptops, tablets, smartphones, smart TVs, home automation hubs, and Alexa-enabled devices, this router is all you need. It can deliver up to 1900Mbps speeds which is more practical than other devices that claim the same speeds. It is supported by a 1Ghz core that brings everything into perspective. At the back of this router is a selection of ports from a USB 2.0 to the WPS, reset button, four gigabit Ethernet ports, and a WAN port. You can share your files from a USB drive or share printers if you are using it in an office setting. Once you plug in this router, set up is quite effortless. It has an array of icons on the user interface that helps you to complete the setup fast and easy. You will also like that it does not have any background app to control the router. This eliminate drags during connection. The only way you can control the TP-Link Archer C9 AC1900 is by downloading the TP-Link mobile interface. If the white glossy finish does not attract you, you will love the idea of buying a reasonable wireless router for better streaming, browsing, and gaming. It is a high-standard router that gives you long-range performance. Some people will not agree that the Google NLS-1304-25 Wi-Fi System is a router, but its performance qualifies it for so much more. This system gives you the most incredible Wi-Fi coverage of 1500sqft with one point. This means that with three points you get up to 4500sqft coverage. 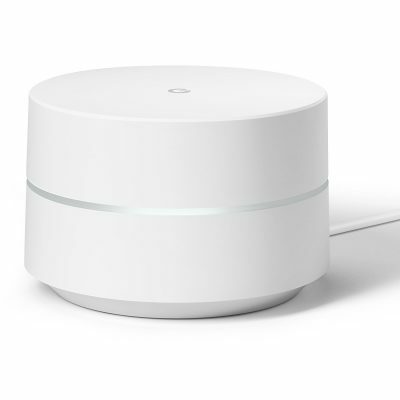 This Google Wi-Fi system has dual-band Wi-Fi coverage and can achieve fast speeds for a seamless connection. By using the Network Assist Technology, this system can select the clearest channel which gives you a speedy connection. It is ideal for streaming and browsing but not so much for gaming. Its main advantage is in the coverage since it is more than you can expect with a single router. From the basement to the sunroom, you can count on a seamless Wi-Fi connection. This system comes with a companion app that plays a vital role in the setup and management of this router. The user interface is fun to use. It gives you access to the network such that you can create a guest network, manage your passwords and access parental controls. This allows you to pause internet access on your kids’ devices. With the quad-core processor, it means that it can execute commands fast. It has 512MB RAM which is pretty impressive for such a small system. What’s more, it has two gigabit Ethernet ports and a port that acts as the WAN and LAN port. This system is also compatible with voice commands and Amazon Alexa. For homes where coverage with one router is an issue, you can count on this Google System to bring the groove back. It connects to a modem or creates a mesh network when using another router. Network Assist Technology ensures you get a fast connection at any point in the house. 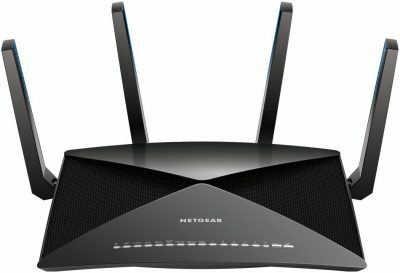 Connect more devices and stream better with the Netgear AC1750 Smart Wi-Fi Router. This model boasts a dual frequency design that automatically assigns high-demand network needs to the less crowded 5Ghz frequency. When operating the 2.4Ghz band, this router can deliver data rates at a speed of 450Mbps while delivering 1300Mbps on the 5Ghz band. We like that it is not a massive router, so it will not need more space on your base station. This dual-band router supports beamforming technology. It improves performance by allowing signals to be sent directly to your devices. It has three high-powered antennas and amplifiers that increase the range to give you reliable coverage. When it comes to streaming, you can optimize traffic to reach your desired devices with the help of Advanced QoS. It is a handy feature for gaming and HD streaming. You can also make wired Gigabit connections when you want the fasted connections for streaming online videos. It has four gigabit Ethernet ports and supports DLNA. You can share files via USB 2.0 or USB 3.0. Not to mention, you have lots of control settings using the Nighthawk app. It gives you parental controls that allow you to filter through web content for connected devices. You can create a secure and separate network for guests as well as secure your Wi-Fi connections using WPA/WPA2 wireless security. The Netgear R6400 is an excellent pick for streaming. It achieves high speeds in both long range and short range streaming. With all its support and Wi-Fi management features it is designed for households with regular streaming needs. Are you looking for a router engineered just for gaming? The Netgear Nighthawk Pro AC2600 wireless router meets your exact needs. It is compatible with PlayStation and Xbox for a memorable gaming experience. From the looks, you can tell it is a gaming router thanks to the air inlets on the sides. Its interior components support heavy gaming which can lead to heating up of this router. With the side air inlets, they ensure you don’t experience delays when playing fast action games. This router is built to optimize your gaming time owing to the high throughput speeds at close range. It is a dual-band router that allows prioritization of your gaming consoles for fast Wi-Fi speeds. Its gaming dashboard will enable you to view bandwidths in real time so that you can customize the network traffic to meet your gaming needs. You can also keep tabs of your CPU usage, memory, and latency. A 1.7GHz dual-core processor with 512MB RAM and 256MB flash memory powers this router. It is on a fast track to quick delivering of demands when you have many devices connected to it. You will love that it supports MU-MIMO data streaming for simultaneous data delivery. The Netgear XR500 has beamforming technology which keeps signals focused on your devices. It achieves faster speeds on the dual bands since it can deliver 800Mbps on the 2.4GHz band and 1733Mbps on the 5GHz band. The unique aspect of this router is that it utilizes gaming operating system known as DUMAO. It is an intuitive operating system which allows you to allocate bandwidth, prioritize networks, and monitor resources. It is what we referred to as real-time monitoring of the CPU, bandwidth, and the various statuses on your network. Why invest in the best gaming gear and play with a router that does not deliver concrete gaming needs? Netgear XR500 gives you gaming features that only a gaming router can offer. The gaming dashboard, operating system, and network monitor all contribute to the ideal router for gaming. Asus is a renowned producer of streaming and gaming devices. This router is a multi-purpose unit designed to cater for small and large homes the same. It is a dual-band router that boasts high speeds of up to 2900Mbps on both frequencies. This router gives you uninterrupted signals by channeling the signals according to your needs. It comes with lots of supportive features which come in handy for fast Wi-Fi when streaming 4K videos and gaming. It supports MU-MIMO technology, and it has QoS options such that you can prioritize the network traffic. It dedicates the Wi-Fi network to multiple devices at the same time so that all your family members can enjoy browsing and streaming at the same speeds. Powered by a 1.8GHz dual-core 32bit processor, this router is at par with many gaming needs. It has a gamer’s private network that helps the router to optimize the network to choose the less crowded band for game packets. You will love using it as it gives you minimal packet loss and low-ping time. This router has thoughtful security features thanks to the Aiprotection that is powered by Trend Micro. It keeps you from experiencing downtime owing to hacks and attacks. This way, you will always be operational whether at home or when completing office tasks. 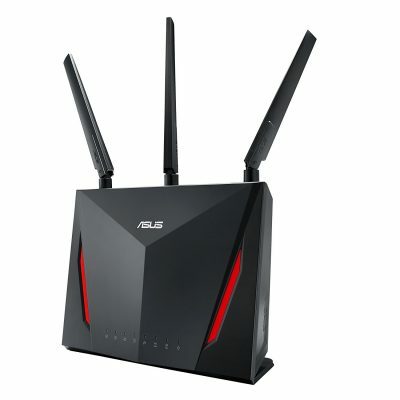 Whether you want to browse, game, or stream 4K videos, the Asus AC2900 RT-AC86U is a good pick for a multipurpose wireless router. You get more than you pay for as it explores a powerful dual-core processor with lots of customization options. A good wireless router makes a world of difference to a home where internet demands are never-ending. If you have serious gamers and family members in need of continuous streaming; you will need to take a few considerations at heart. When looking at wireless routers, you will notice that they have the 802.11n, 802.11ac, and 802.11ad protocol. This technology allows sending and receiving of data at superfast speeds as the bandwidth does not impede them. If you have regular Wi-Fi needs, you will be okay with routers that utilize the 802.11n protocol. They can achieve up to 600Mbps data rates on the 2.4Ghz band, and operate seamlessly in the 5Ghz band. They also incorporate MIMO technology (Multiple Input Multiple Output). Such a router can receive and send data with several antennas to reach four spatial streams. The 802.11n protocol router is ideal for homes with several devices that share the same network. Several users can browse and stream using their laptops and phones on this protocol. The 802.11ac and 802.11ad is the latest technology that allows for use with heavy gaming, large data transfers, watching via smart TVs, etc. They utilize advanced technology including beamforming technology which focuses the signal on the user, Multi-user MIMO which allows data transfer to each user simultaneously, and wider channel bandwidth. When you know your specific needs, you can focus your attention on the speeds indicated by the router as it will give you a good idea of how fast it is. If a router indicates it is an AC1750 router, it means the maximum speed it can achieve in theory is up to 1750Mbps shared on the 2.4Ghz and 5Ghz on a dual-band router. Practically, this router will be faster than an AC1200 router operating dual-band frequencies. A single band router is the least expensive. It connects via 2.4GHz frequency band also operated by other devices like a microwave, wireless and Bluetooth devices. Routers on this frequency have to compete with other devices on this band. As such, you may experience delays if you are using the router for high demands like gaming and streaming. Dual-band routers, on the other hand, can operate on the 2.4Ghz band and the 5GHz band. The 5GHz band does not have lots of devices that operate on it; hence it is less crowded. This makes it useful for gaming on the Xbox Live, watching YouTube videos, torrent downloading, streaming Netflix movies, and so much more. If your home has more traffic than the typical home, you may need to look at triple-band routers. They not only operate on the 2.4GHz band and 5GHz band, but they also have an extra radio to operate the 5GHz band. They are fit for large homes, and their connectivity can span over a very long range. Although your router will indicate its range, it’s crucial that you note that it will rarely reach what it anticipates in writing. For that matter, if you have a large home, you will need a router that shows it can cover more than the area you want it to reach. Most homes are good with a router that can reach 150ft coverage, but you can’t go wrong with one with more range. The processor and the RAM are crucial components of your router. You will need lots of processing power if you are accessing the internet through gaming consoles, multi-media devices, and smart TVs. Single core processors are good, but dual and quad-core processors are better for more and faster data transfers. You should aim at a router with high running power such as 1.2GHz for extensive Wi-Fi needs. This is another important feature as you will want to have control over your router. Look for a router with Quality of Service (QoS) which allows traffic prioritization, Parental controls to control access times for kids, and guest-network features that help to allocate a separate network to guests in order protect your files and other connected devices. You should look for routers that have a USB port preferably two USB 3.0. For Ethernet ports, routers with four or more 10/100/1000 Ethernet ports are more useful when connecting your wired devices like home automation hubs and desktop PCs. Picking the Best Wireless Router is always tricky. We hope we have shed some light by giving you a detailed look into our top picks. These wireless routers cover a wide spectrum from extensive streaming to long-range coverage, gaming, and high-speed Wi-Fi needs. Shop with confidence as these are the Best Wi-Fi Routers in 2019. Thank you for writing this amazing & informative blog post.